After successfull installation, a graphical installer is available when opening the url http://localhost/ in the browser. 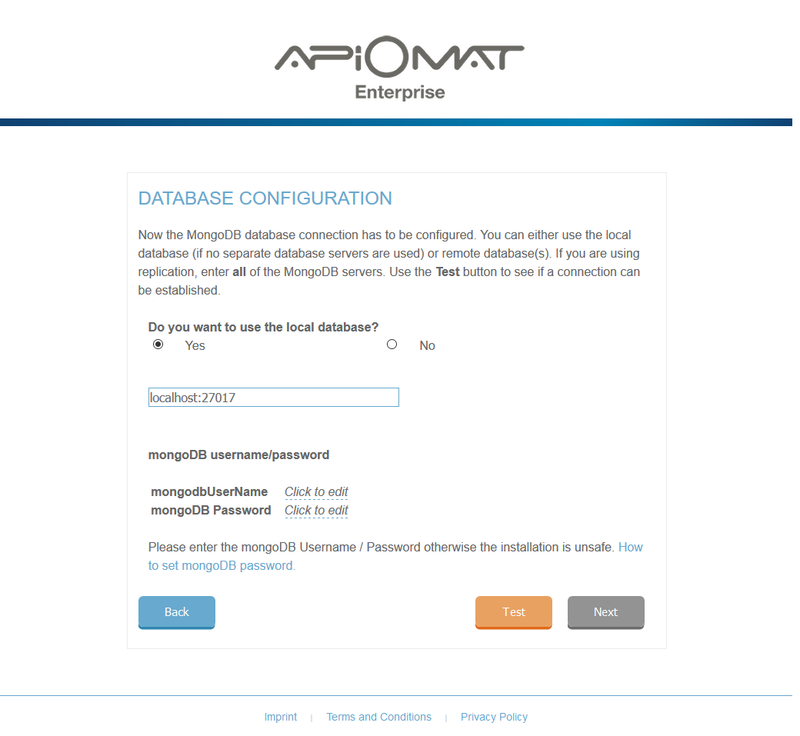 The installer will set up credentials for MongoDB such as basic ApiOmat accounts and will help to set up the license. After finishing the installer, the url http://localhost/ will point to the Dashboard itself and the installer won't be accessbile anymore. To re-enable the installer, delete the installerFinished:true setting in apiomat.yaml/yambas.conf. But be aware: the enabling of the installer will allow everybody to change the SuperAdmin password and other configuration entries. The first page requires to set up the URLs of the system. The internally used adimistrative URl can stay as it is. 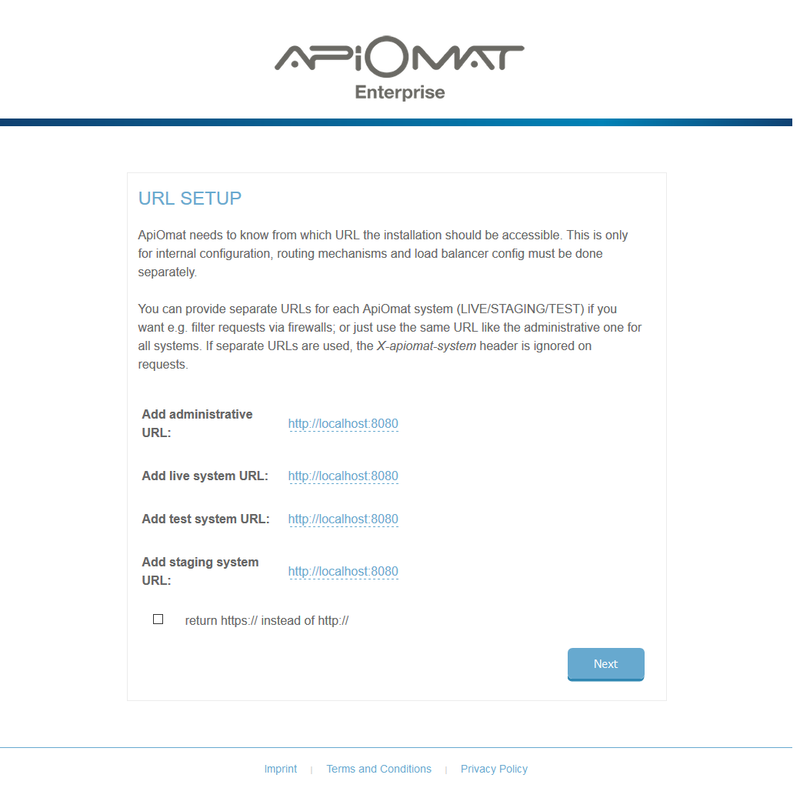 The live, staging and test URL are the URLs which are returned for the three systems in ApiOmat and should therefore be accessible from outside. ApiOmat needs a valid license to run. 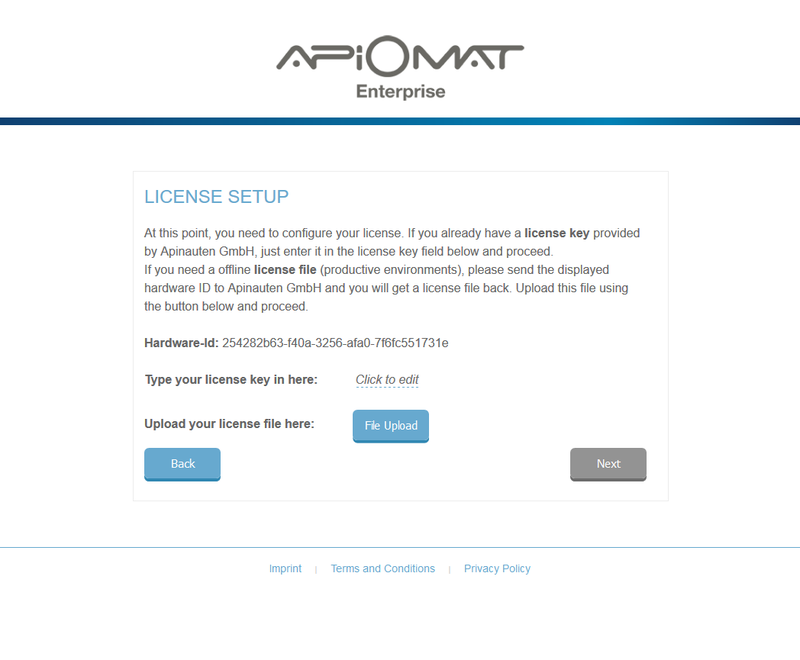 Upload or insert your personal license obtained by your ApiOmat contact here. You can also use the trial license here, which has some limitations regarding the number of applications or modules. The next step lets you configure a database connection to MongoDB including credentials of the database. Please use the Test button to check database connections before proceeding. 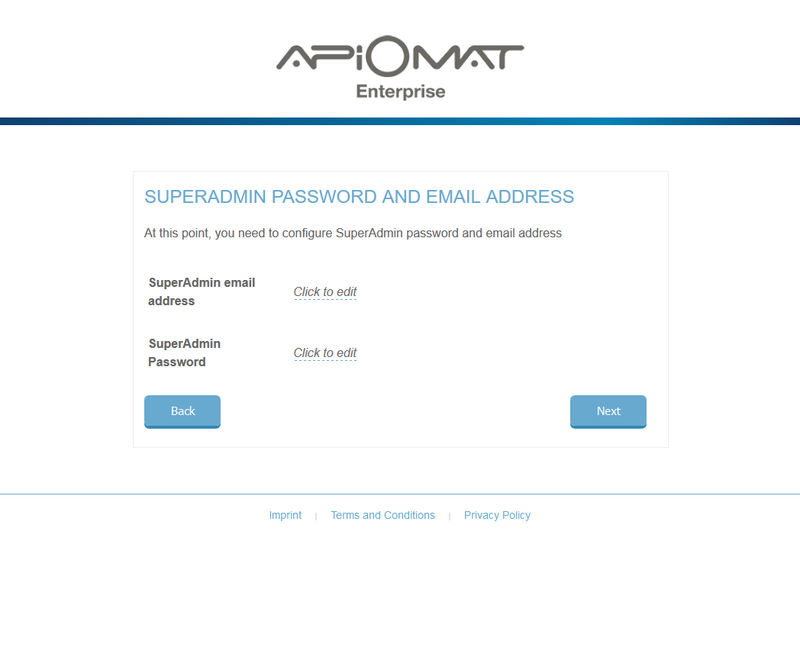 In this step the credentials of the first ApiOmat user, the SuperAdmin, will be set. The SuperAdmin is an account with all possible roles to manage the system. Please store the credentials at a safe place. 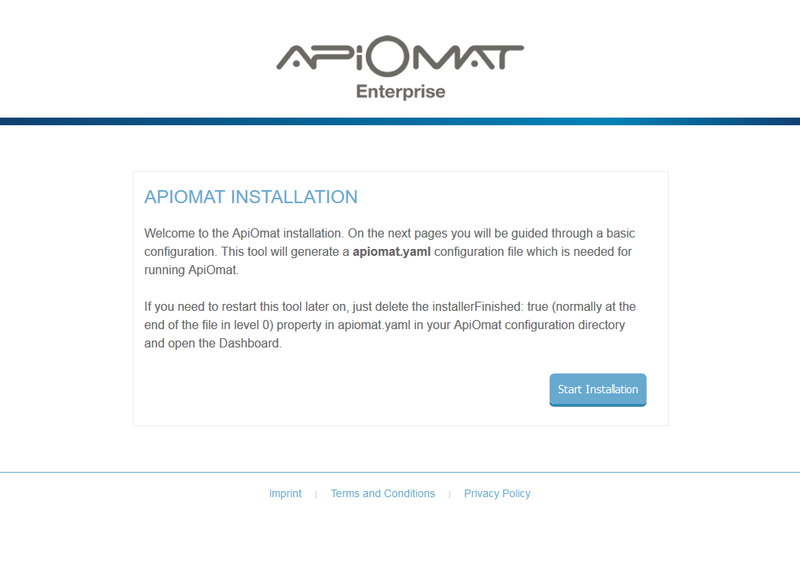 After this step, the installer is finished and ApiOmat will restart its service with the new values. Please be patient for a moment and head over to the Dashboard afterwards.